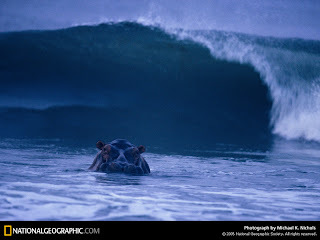 i am a lefty: surfing hippos? the only thing i knew about gabon before coming here was surfing hippos. they have hippos that come out onto the beach and play in the ocean. they actually still have hippos. in Congo they have all been decimated by trigger happy militias. i also found out that the population of kinshasa is about 10times all of gabon. (so how did the 7 billionth baby get born in gabon?? should have been DRC. where the baby probably has a 10% chance of getting AIDS, and a 90% chance of having a miserable life...) and that's really where the difference is. oh, and all the oil money. which is why the maps I'm making are pretty boring. green...green...all forest...green. and lots of mining and forest concessions though, almost the entire country. so that's the main issue, but still, the forests are full of animals, not so much of people. they have fresh croissants, cafe au lait! france24 on every tv (al jazeera shows nothing but football), you can walk on the streets day or night, traffic jam? what's that? and there is a fresh breeze from the beach, which is right there, where you can also swim, and find sea turtles nesting at night. this is a capital city. in africa. though the house where i'm staying has no hot water, the sink is clogged and there is no internet...but hey, you can't have it all.